As our Flower theme comes to a close I want to share a few of the things we did we this past week that I didn't get to post. The Lil Divas worked on Do-a-Dot Letter f's courtesy of Confessions of a Homeschooler - the lil divas really like doing these. 3. 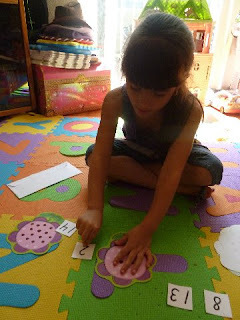 Then using word cards I had made they labeled the appropriate parts of the flower. 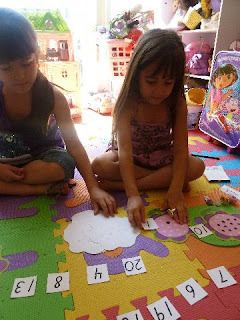 - The Lil Divas took turns picking a flower and couting the seeds and then finding the correct number card. Hope you enjoyed our Flower/Garden Theme as much as we did! If you missed any of our activities just click the link to check out everything we did! I love your alphabet themes! I'm going to subscribe and pass your blog on to a friend who is just starting to homeschool her little guy. Great Job! Very creative! Love the lunch and the sequins! Fun theme! Looks like flowers are the order of the day! Most definitely beautiful and wonderful. Love your fruit flower!